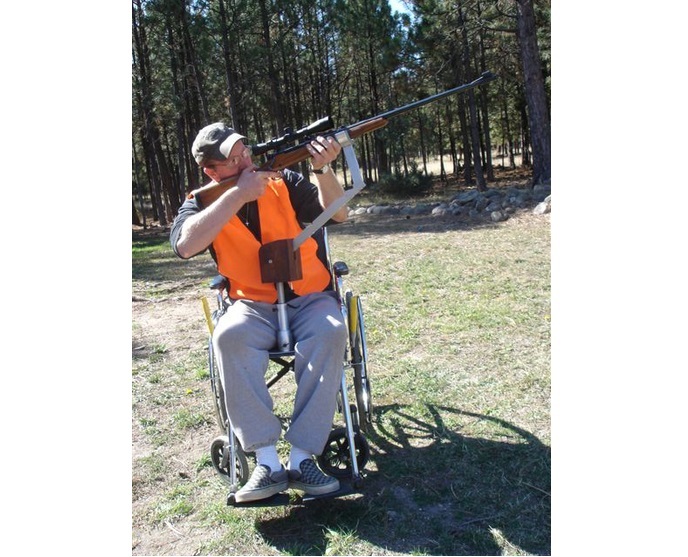 The Paraplegic Rifle Rest is for disabled people in wheelchairs who would still like to hunt & shoot. They may lack arm & hand strength and shake too much for holding up a rifle. The Rifle Rest gives stability to the rifle and makes it steadier when you are shooting. To get in and out of your chair, first set the aluminum sheet on the seat of the wheelchair with the boss at front. Remove the boss by unscrewing and removing the boss with 3/16 Allen wrench. Then put the seat cushion on top of the aluminum sheet. Have a caregiver set you on the seat if needed. Your weight will keep it stable! Now screw the boss into the aluminum sheet, then insert the Rifle Rest into the boss. The fore-end support half round rotates 360 degrees, pivots up & down under spring pressure and rotates side to side, with a lot of height adjustment. This rest will help people to shoot more consistently & confidently as the rifle is supported. Reverse the procedure to get out of your chair.